All of the decorative, hand forged, iron details on our custom furniture are made in our factory by our residential blacksmiths. 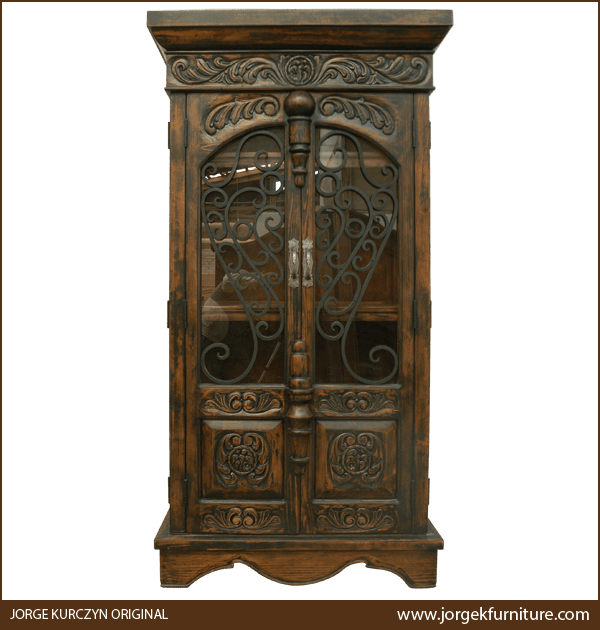 This handcrafted, Spanish colonial style armoire has a straight, solid wood, crown molding, and directly below the crown molding are marvelous, hand carved, floral and scroll designs. The front of the armoire has two, large, rectangular doors with an open, arched design. The open area is embellished with arched, hand forged, ornamental ironwork and behind the ironwork are two, foldable, arched, glass doors. Each solid wood doorframe has a silver finished, hand forged, iron handle on its side. Above and below the handles are classic, hand turned details, accompanied with hand carved, floral designs. The bottom of the door features two, square cut panels, and each panel is adorned with gorgeous, hand carved, scroll and floral designs. The base of the armoire has a solid wood, curved apron, and this design is repeated on the sides of the base. Each lateral side of the armoire has a geometric cut panel. 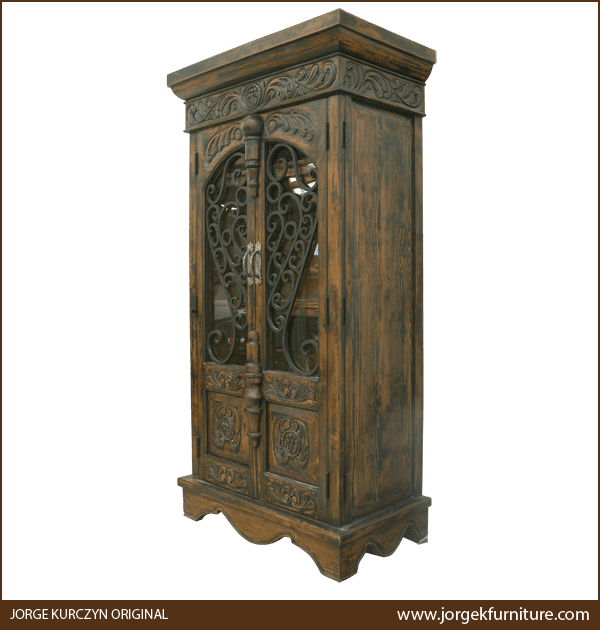 The armoire has an antique finish, and it rest on sturdy, solid wood feet. It is made with the best, sustainable, solid wood available, and it is 100% customizable.